In a welcome move, which is sure to have long-term growth repercussions on the Geographical Indication products from India, Mr. Suresh Prabhu Minister of Commerce and Industries, Govt of India has announced that all the airports in the country will soon have ‘Geographical Indication Stores’ which will promote products unique to the region in which the airport is located. 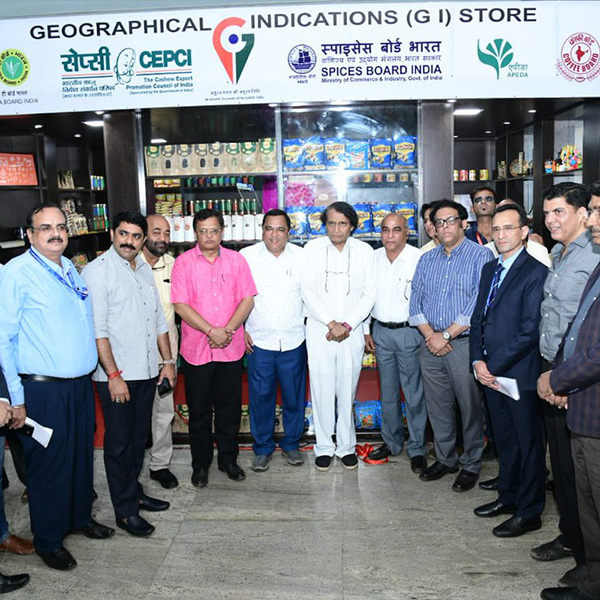 In this regard, Mr. Prabhu inaugurated the first-of-its-kind ‘GI Store’ at the Goa Aiprot, to promote products unique to that region. The Civil Aviation Ministry has signed a MoU with the Goa government, and soon such agreements will be signed with other governments to promote local products including those made by women’s self-help groups. The much talked about Agriculture Export Policy 2018 had talked of promoting GI products through branding and marketing. GIs, if properly branded and marketed, can very well contribute to exports and popularity. They can also contribute immensely to earning the vital foreign exchange and have capacity to play a major role in trade between India and other countries. The immense revenue potential of GIs necessitated their cross-border protection and thus these were included in the ambit of the TRIPS Agreement. The Article 22 of the Agreement, which forms the centrality of GI protection, provides for a general level of cross-border protection of GIs in the course of trade, which is extended to India and other developing countries. In India, the state of Karnataka has the maximum number of GIs registered. From handicraft products such as Kanjeevaram silk sarees, Chanderi fabrics, Mysore Jasmine, Bidri metal works, Kotpad handloom to Darjeeling Tea, Kaipad Rice, Mizo Chilli and Nagpur Oranges, there is immense potential if these products are effectively marketed and protected against illegal copying. This means requirement not just for effective marketing but also for protection related to quality assurance, brand creation, post-sale consumer feedback and support, prosecuting unauthorized copiers, etc. Legal protection to GIs shall also extend to protection of traditional knowledge and traditional cultural expression contained in the products. This will not only ensure protection of livelihoods but also enhance possibilities of employment generation. This is the reason why Mr. Suresh Prabhu’s quick initiative of inaugurating a GI store in Goa will have far-reaching positive repercussions. GIs have the potential to be our growth engine and the priority focus on GI products will help India reap good rewards.